There are so many bits of good news with this post! First of all, yum. Secondly, it’s really not risotto, but just accidentally overcooked millet, that is the basis of this recipe. Third, since it’s just overcooked millet, it really couldn’t be any easier. And, of course, finally, you could spice up this very, very, very basic recipe in many, many ways – with herbs and spices, with vegetables, with delicious sauces, and I’m even thinking of a sweet version with coconut butter, palm sugar, and cinnamon. Of course, it started as an accident. I soaked millet, then added way more water than usual, and it turned out as mush. But, mush that was easily formed into cakes without the addition of eggs or cheese or any other binder. Somehow this brought risotto cakes to mind. I’ve only had risotto cakes when eating out, because of course they are just a delicious way to use leftovers and I don’t typically make risotto. These days, since I don’t really eat dairy or eggs, I would have thought risotto cakes, which I do really like, were a thing of the past. But, just when I was least expecting it, like leg warmers and skinny jeans, they came back upon me! 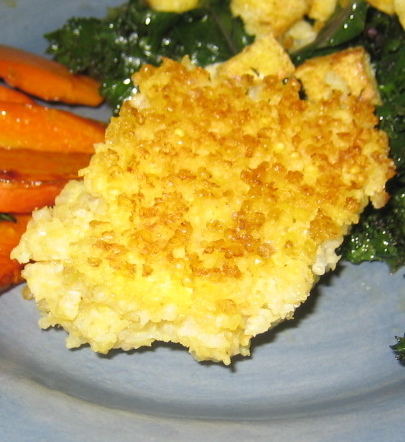 So, I decided to fry up my little millet mush patties and see what happened and was very pleasantly surprised by their crunchy outsides and creamy insides that would be so amenable to a variety of additional flavors. While I normally cook millet by adding the grain to boiling water, in this case I’m putting the millet in cold water, then bringing it to a boil before simmering This will make the millet even that much stickier, because it will develop the starch a bit more. 2-3 teaspoons ghee or olive oil, plus additional oil for pan-frying. Ideas for optional additions: caramelized onions, steamed spinach or other finely chopped greens, garlic, chopped tomatoes, fresh or dried herbs, etc. Drain soaked millet and rinse well. Put the millet in a small-medium saucepan with the water and salt. Bring to a boil, cover, and reduce heat to medium-low. Simmer for about 25 minutes, or until the water is absorbed. Turn off the heat and let the millet sit for about 10 minutes covered, then remove the cover and stir in ghee or oil, and salt to taste, as well as any additional ingredients. Season to taste. Allow it to cool until you are able to handle it. Once it’s cooled down a bit, take large spoonfuls and press the into balls with your hands, then flatten the into patties. You can cook them right away or refrigerate the patties until you are ready to eat them. Heat a skillet over medium heat, add oil, then place the patties on the hot oil and cook 3-4 minutes on each side, or until lightly browned. Eat immediately. Enjoy! Shiitake mushrooms are millet are, to me, a perfect match. I haven’t exactly thought about why, but maybe it’s that the earthiness of the mushrooms is complemented by the sweetness of the millet. Maybe it’s the slight chewiness of the mushrooms against the softness of the millet. Maybe it’s the colors. Who cares, really, because they are delicious together. Heat a large skillet over medium heat. Give the shiitakes a quick rinse and put them into the hot pan. Sprinkle with sea salt, cover, and leave them for about 4 minutes. Move the mushrooms to the side and pour a little olive oil into the space you created. Add the shallots and crushed red pepper flakes and cook until the shallots are soft, then add the chopped greens and sprinkle with salt. Spread the cooked millet on top to keep some of that steam in and cook until the greens are wilted. Turn off the heat, stir in the mushrooms, taste, then adjust seasonings. Top with the protein of your choice and enjoy!